Newcomer Family Obituaries - Frank Joseph Balint Jr. 1927 - 2019 - Newcomer Cremations, Funerals & Receptions. Frank Joseph Balint Jr., 91, went home to be with the Lord on Friday, February 8, 2019. He was born December 9, 1927 in Yonkers, New York to Frank and Helen Balint. He spent his childhood years in Yonkers, NY, Little Rock, AR, and Morgantown, WV. He enlisted in the service immediately after graduating from St. Francis High School in Morgantown. Frank spent 4 years in the Army/AirForce where he received an honorable discharge as a Sergeant in 1948. He attended West Virginia University and graduated with a Bachelor of Science Degree in Business Administration. He worked 49 years for the Goodyear Tire & Rubber Company. 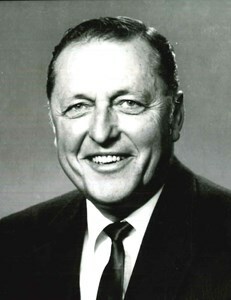 During his tenure at Goodyear, Frank managed the Goodyear softball complex, children’s basketball league, Goodyear Bowling Alleys, and was founder of the Akron Traveling All-Star Bowling League. From 1969 until his retirement in 2002, Frank was manager of Goodyear’s Wingfoot Lake Park. Through his leadership, the park became one of the finest corporate recreational facilities in the country. Goodyear commemorated his leadership by renaming the main building in the park “Balint Lodge”. Frank is survived by son, David Balint (and fiancé Sharon Crace) of Akron, OH, son and daughter-in-law Barry and Carol Balint of Atlanta, GA, son and daughter-in-law Jeff and Peg Balint of Jacksonville, FL, and daughter Susan Balint of Atlanta, GA; 7 grandchildren, 8 great-grandchildren; his brother, Ray Balint of Cuyahoga Falls, OH: sisters, Helen Borkowski of Parkersburg, WV and Kate Dunmire of Morgantown, WV. He was preceded in death by his two baby daughters, Anne Frances and Melinda. The family wishes to thank the staff of Mulberry Gardens Assisted Living and Harbor Light Hospice for their wonderful care and affection. If desired, in lieu of flowers, friends may make memorial contributions to Mulberry Gardens Assisted Living, 395 S Main St, Munroe Falls, OH 44262 or Harbor Light Hospice,207 Portage Trail, Ext. West, Cuyahoga Falls, Ohio 44223. Family and friends may visit on Friday, February 15, 2019 from 5-8 p.m. at NEWCOMER FUNERAL HOME, 131 N. Canton Rd., Akron. Funeral Mass will be held on Saturday at 10:30 a.m. at St. Joseph Catholic Church, 2643 Waterloo Rd. in Randolph. Interment at St. Joseph Cemetery. Add your memories to the guest book of Frank Balint Jr..
What a wonderful video tribute to your father. I worked for Frank Balint at Wingfoot Lake Park back in the 70s. It was my very first job and lasted approximately 5 years. In that short period of time, I learned so much about life and the world of work through Mr. Balint. He expected you to be busy at all times. The customer was always first. Everything had to be done in the same order every time for accuracy and dependency. He was fair and strict. The cash register was guarded and center in the room. No dust or chair out of place was tolerated. He ran a tight ship. Thank you Mr. Balint, I learned so much from you. Carol, I cherished my years of working with you. We had so many laughs and "adventures" through the park: ordering candy, eating candy, serving food, cleaning the cases, packing bait, renting boats, and manning the doors on the look out for your father-in-law and customers!!! Do you remember the long hours of listening to Neil Diamond albums and Englebert Humperdinck??!!! Frank Balint will forever be a strong influence in my life and work ethic. I am grateful for the time he spent teaching me and the hundreds of other teenagers that worked for him. My deepest condolences to the family. May he rest in peace. My heart felt symphathy to the extended Balint family! Frank and I first met during my first week of work at Goodyear in June, 1969. I had just graduated the U of W Va Institute of Technology. Being both former "hillbillies", we hit it off from the start. My first project was remodeling Goodyear Lanes under old Goodyear Hall, which he managed. Later we worked together again doing many projects, and lake fish management at Wft Lake Park. Frank was a dedicated, "no nonsense" type of person(which earned the respect of 'most' people who knew him!) and we had many years of work interaction, and great friendship! My one regret was that in all those years, I never once got to play a round of golf with Frank(which he would have won handily!). You will be greatly missed, my friend! Truly a memorable, Goodyear character/legend!! You will forever be in my heart! It was an honor being able to take care of you!